So here we have a new band that deserves respect and attention despite its recent activation. They claim to deal with Modern Progressive death metal and that is partially true if we look at the sounds, sometimes modern, often belonging to Classic metal. Moreover, there is some Thrash and lots of Death and Heavy metal but no Prog metal, except a couple of guitar solos in the vein of Dream Theater. Not that big of a deal, but if a label decides to promote a band, they ought to be more precise. As to the lyrics, I have to step up to the band's defense and say they're some of the best and deepest I have happened to read recently; connected to the marvellous artwork by famous Brazilian drawer Gustavo Sazes (Gus G, Firewind, Nightrage, Cryptopsy, Sonic Syndicate, Tribuzy, God Forbid, Almah, Krisiun and several others), the songs deal with a constant mood of doom already from birth, as witnessed by the newborn's cries at the beginning of the opener. The invisible cage surrounding most of us leaving brief glimpses of hope, happiness or satisfaction worsens with the tightening of the social slavery and emargination's net leading to exponential rage, hatred and frustration. I bet many of us - me for sure - felt somehow protagonists or at least partecipant in the characters' events, and this is a plus to plunge oneself into the record's spirit. Yes, sometimes a solo brightens the hard situation and that represents the very few gleeful moments of our life we can enjoy when we are not bored or in pain. The opening of the attack starts with the courageous and self-confident title track, a rather long composition beginning with a superheavy riff. This song of Death and Classic metal makes us realize how great the whole performance of Sofia Raykova will be both in her growling and and in her cleaning singing. Superb are the solos in the style of Dream Theater and Marty Friedman by guest Andrew Smirnov (member of Russia's Master and Everlost, and also Epidemia and Shadow Host). "Controlled by Hate" contains catchier riffs and licks and loves playing with monophonic effects. Sofia's growls have nothing to envy Angela Gossow's or her male colleagues', and her ability of mixing or alternating them with clean vocals can't but remain unnoticed. After the marvellous melody in the central part there's place for a guest shredding solo by In-Quest's Douglas Verhoeven, while the lead guitar goes on the path of the early In Flames. "Lifeless Existence" advances like a caterpillar; once again Death metal with a few Classic metal riffs here and there; the refrain reminds of the latest In Flames, yet for sure there are also more modern passages, although the two guitar players don't do anything to hide their steady Maidenian influences during certain licks. I find this to be the most comprehensive song, able to show the Moscow act's quite a lot of points of view, and yet smooth notwithstanding the several rhythm changes that the drummer tames well. 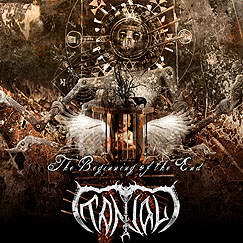 With the instrumental "When Clarity Comes..." Tantal prove their two axe players are not inferior to the guests, both in the solos and in the acoustic structures. 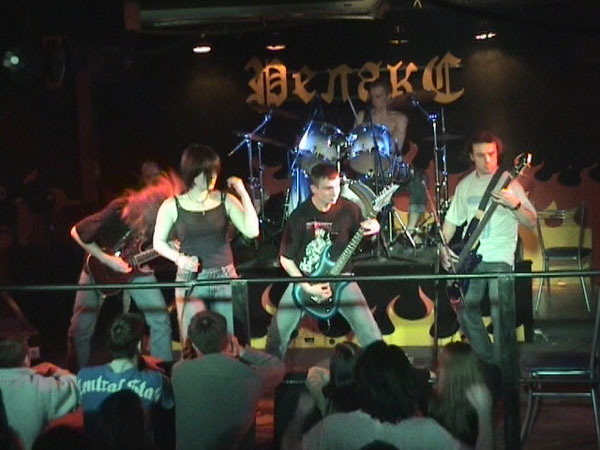 In "Suicide" some modern keyboards and torment sobs are added, while the fast guitars and the exploding drums lead the song forward with dexterity. Though all the recording is professional, the bass is never in your face, however here especially (and also in other two songs) is more present than elsewhere. There's also a nice video for this song (http://www.youtube.com/watch?v=2viu0G3D4oo) ,in which you can clearly see the two guitar players' techniques and understand why ESP has decided to endorse them. Look out or the sharp riffs in "In the End Pt. 1 (Agony)" shall cut you deep! As if it weren't enough, threatening keyboards (these are modern and in a way 'progressive' indeed) precede riffs similar to Dark Tranquillity's. But there is much more. In this song and only here Sofia's heritage comes out; along with the crushing guitars, her sadness-evoking clean vocals remind of the hard times of the Soviet/Russian people, its tragedies (environmental, political, economical and social); this song should be taught in every serious Russian art and music faculty. Brutal is the drumming and on some occasions very fast, for a quite unusual composition, as the Moscow combo prefers to go mid-paced most of the time. And now "In the End Pt. 2 (Epitaph)"...Oh, damn, I think I've listened to that so many times this year that it's only thanks to the fact I always find new details or nuances that I never get bored of that. Great riffs and vocals, adrenalin and class at their purest state, whispered vocals, a divine performance by the two guitarists and not only owing to the Malmsteenian solo, and at last clean and incessant drumwork will make it irresistible to you, too. In the end, "Farewell", an instrumental closing track including vultures crying on the rotting corpse of the person nobody cared for, destined to oblivion. It could be an orphan, a widow without relatives or friends, or a homeless. It's a story that keeps on repeating in once rich countries where social assistance has remaned a utopia on the paper, everyday even at the threshold of 2010. We have to admit the 5-piece hasn't invented anything, still it offers an interesting and professional blend, made more enticing by the three guests, among whom keyboardist Alexander Dronov is in practice the sixth member on this album. A strength of the band resides in the capacity of choosing good songwriting solutions; since I haven't heard its previous promo I can't say if it's improved or not. Only time will tell if this masterpiece will have been thrown like pearls to pigs or if the combo will reach the last rung of the ladder.